The Dogra community was among the best fighting material to be found in India during World War 1. As Indians, they had a keener sense of national pride and a higher feeling of national integrity than other communities. A Dogra is a shy, reserved man with the considerable strength of character. They have a high idea of honour, of self-respect and the duty of a capital soldier. They have been long known as brave and faithful soldiers and loyalty to their salt is with them as the breath of their nostrils. An Army magazine on World War 1 complimented "More solid than brilliant, they are full of quiet and resolute courage when face to face with danger. Law abiding and well behaved, steady and resolute, though not showy of courage, their virtues shine forth in moments of peril when they will face certain death with a calm and determination to do before they die." His Majesty the King, has been graciously pleased to confer the Victoria Cross on No. 501 Lance Naik Lala, 41st Dogras, Indian Army, for most conspicuous bravery. "Finding a British officer of another regiment lying close to the enemy, he dragged him into a temporary shelter, which he himself had made, and in which he had already bandaged four wounded men. After bandaging his wounds he heard calls from the Adjutant of his own regiment who was lying in the open severely wounded. The enemy was not more than one hundred yards distant, and it seemed certain death to go out in that direction, but Lance Naik Lala insisted on going out to his Adjutant and offered to crawl back with him on his back at once. When this was not permitted, he stripped off his own clothing to keep the wounded officer warmer, and stayed with him till just before dark, when he returned to the shelter. After dark, he carried the first wounded officer back to the main trenches, and then, returning with a stretcher, carried back his Adjutant. He set a magnificent example of courage and devotion to his officers." A major portion of the Jammu Kashmir State Forces participated in World War 1. The Imperial Service from Regiment saw action in East Africa, Palestine and Mesopotamia and won the Battle Honours of Megiddo, Nablus, Kilimanjaro, Beho Beho, East Africa, Palestine and Sharon. During World War I (1914-1919) the Kashmir Imperial Service Corps not only earned the title of the most "reliable" troops, but the personnel of the regiment were awarded 31 decorations. Their war trophies included the German insignia the Brass Eagle and the German flag captured by the 2nd battalion amongst other German artillery. 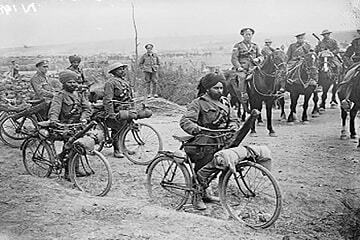 Dogra soldiers fought in WW1 also as a part of the British Indian Army - 37th (Prince of Wales's Own) Dogras, 38th Dogras, 41st Dogras.